Designed for comfort style and convenience this drafting chair is an outstanding value. 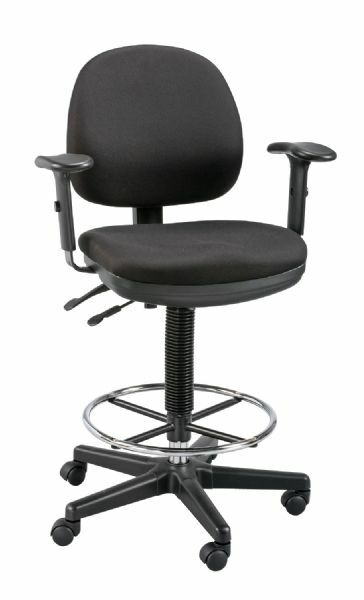 * Features include pneumatic height control with an adjustment range from 23" to 33" padded armrests that are width and height adjustable with seven positions a height- and depth-adjustable backrest with tilt-angle control adjustable seat pitch 18" diameter height-adjustable chrome foot ring dual-wheel casters and a 26" diameter steel reinforced nylon base. * Waterfall seat cushion improves circulation and is 3½" thick x 19"w x 18"d.
* Back cushion is 3" thick x 17"w x 16"h.
* Both are made from ergonomically-contoured molded foam and include polypropylene back shells. The height range is 24" - 29", 30" & up, under 24". Height Range: 24" - 29", 30" & Up, Under 24"
26" x 25" x 13"